This is the first time we've seen the T25 city car from Gordon Murray Design in three dimensions, though we still can't really tell what it will look like, since it's been neatly wrapped up in a shiny package. It's no secret that Murray, the man behind the legendary McLaren F1, has been obsessed with creating a revolutionary micro car. Planned as a 2012 model, the T25 is clearly a return to a car that's truly small as it's comparable in size to a classic Mini or Fiat 500. By comparison, the modern BMW Mini and new Fiat 500 look absolutely massive. We'd be interested to see it parked next to a Smart ForTwo. More from the mastermind himself after the jump. Speech given by professor Gordon Murray at the 1st Anniversary Celebration of Gordon Murray Design. Good evening and thank you for coming to our first anniversary celebration. It’s one year since we began operations at Wharfside and our small company has grown into a great team of 29 very talented people. I have to offer a big thank you to our investors MDV and Caparo, not only for believing in us and the T.25 Project, but for their absolute support in our strategy and day to day running of the business. We are calling this evening a ‘3D Evening’ because although we can’t show you the actual car, we can for the first time reveal the size and profile of the T.25 and through the 3-dimensional medium of the 15 dioramas we can show the impact that the car will have on our motoring world. Tonight is all about giving you an update on the progress of our T.25 programme, to explain our business model and also to explain that it is a complete re-think of both small vehicle architecture and of the automotive manufacturing process. There is no longer a debate about climate change. We have about 15 years left to slow this process down and we all know we have to change our attitude and our habits. Transport is only one part of the problem but it’s an important part because it’s about mobility and personal freedom as well as the environment. I feel sure that in 20 years time we will be looking back and not believing that in 2008 we were dropping a child off at school in a 2.5 tonne vehicle, that achieved less than 20mpg. In just the same way as it is difficult to believe that 20 years ago, more than half the people in this room would have been smoking! In the automotive sector we are making some steps in the right direction but they are far too little to make the sort of difference we need in the next 15 years. For example Hybrids although largely a marketing exercise can make a small improvement in urban areas but are worse in a full lifecycle analysis and do nothing for congestion, parking and mobility. Electric vehicles certainly have a place in urban areas and niche, low volume products but with today’s battery technology they have a bad lifecycle footprint and again do nothing for safety, parking and congestion. Car manufacturers are largely ignoring the problems and almost every new model is launched larger and heavier than the last. There have been a few noticeable exceptions like the Smart and the Japenese KEI class cars but none of these help in all the problem areas. Some companies are making more effort than others like Toyota with their new iQ due out next year. With some design ideas like thin shell seats, smaller air-conditioning units and repackaged powertrain, but that hardly constitutes a re-think, it’s evolutionary design and does nothing for congestion, parking, lifecycle damage or low cost transport and it’s still likely to weigh about the same as an original VW Golf. We have two tools available right now – size and weight – and we need to give motorists an incentive to change to smaller, lighter cars and prove that these vehicles can be safe and above all fun to drive. Innovation is only part of a process – what we need is a step-change in car packaging and in our manufacturing process – a revolution – a complete re-think. We believe that the T.25 architecture and manufacturing process will represent the biggest step forward in our automotive world since the model T Ford, exactly 100 years ago. Our business model is quite simple – the architecture includes a separate body/chassis assembly. The manufacturing process can be adapted to many new powertrains, fuels and body styles. The T.25 is only the first to use this process and Gordon Murray Design is already in discussion with potential customers for other versions of the car. We can offer anything from a simple licensing agreement for the manufacturing I.P through to a turn-key car programme to Job 1, including factory building design and assembly line layout. The manufacturing process brings with it a massive reduction in capital investment and environmental damage. The concept embraces all the challenges and finds solutions: 1. Lower purchase price – substantially less than current small cars. 2. Low cost motoring – approximately half the annual running cost of a hatchback and purchase price pay back in 4 years compared with a small hatchback. 3. Parking – 3 cars in one parallel parking space. 4. Congestion – 2 cars in one motorway lane. 5. Running emissions – less than half the UK average. 6. Lifecycle admissions – at least a 40% reduction. 7. Protecting our mobility. 8. Putting the fun back into driving. Tonight we are privileged to have the wonderful Tantra George Harrison Mini as our centre piece. 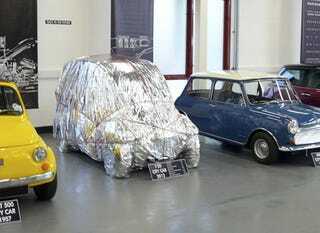 The Mini is an inspiration, it was iconic and classless. That is our aim with the T.25. We can’t show you the actual car because that will belong to our customer, but for the first time we can share with you the actual size and proportions of the T.25. We also have the 15 dioramas to illustrate the impact that this process and architecture will have in the future. What began as an idea in 1993 is now a reality – it certainly represents the toughest challenge I’ve ever faced in my design career, but I now have what I consider to be the world’s best automotive design group to help deliver the next big step forward. Thank you and have a good evening.